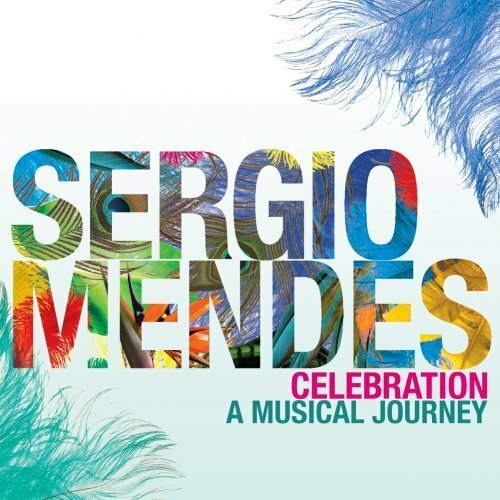 This year, Sergio Mendes celebrates his 50th year as a recording artist. The Brazilian musician is most closely identified with the romantic sounds of bossa nova, though his career has been an eclectic one. His latest recordings have embraced hip-hop sounds in collaboration with The Black Eyed Peas, Justin Timberlake, John Legend and India.Arie, while he did much to define the classic sound of A&M Records in the 1960s, a blend of bossa nova, jazz and soft pop (think: Herb Alpert and The Tijuana Brass, Chris Montez, and of course, Brasil ’66). In recognition of his half-century in music, Universal’s Verve arm will release Celebration: A Musical Journey on April 5. Over 39 tracks on two CDs, Celebration is a career-spanning look at the joyous and sensual music made by Mendes, primarily at A&M and Concord. When Herb Alpert signed Mendes to his A&M label, few could have predicted the immense crossover success the artist would have. Brasil ’66 debuted on an eponymous LP in 1966 with Mendes joined by Lani Hall (later Alpert’s wife) and Janis Hansen on vocals, Bob Matthews on bass, Jose Soares on percussion and Joao Palma on drums, with John Pisano on guitar. Herb Alpert lent his personal touch as producer. This lineup was a veritable hit factory turning out singles like “Mas Que Nada” (No. 4 AC), “With a Little Help From My Friends” (No. 31 AC) and “Night and Day” (No. 8 AC) within a year. But 1968 marked the breakthrough of Brasil ’66. A cover of Burt Bacharach and Hal David’s “The Look of Love,” dramatically rearranged from Dusty Springfield’s Casino Royale original, soared to No. 4 pop and No. 2 AC. Mendes and his band even performed their swirling, groovy treatment on the Academy Awards! “The Look of Love” appeared on Brasil ’66’s third album Look Around, with some arrangements by Dave Grusin. Then Mendes dramatically dismissed the group members other than lead singer Lani Hall. From the new lineup (still known as Brasil ’66) came “The Fool on the Hill” which topped AC and went No. 6 pop, and “Scarborough Fair” (No. 2 AC, No. 16 pop). Both tracks appeared on the LP Fool on the Hill, on which Mendes took over production duties from Alpert; Grusin returned as arranger and conductor. Mendes had hit on a winning formula, reinventing current pop songs in his bossa-influenced style. Karen Philipp joined as a vocalist, and Gracinha Leporace, who would become Mrs. Sergio Mendes, made her first appearance on a Mendes LP. (Mendes would produce the 1970 A&M debut of Bossa Rio, featuring Leporace on vocals. This album had a very similar feel to Brasil efforts, with covers of “Up, Up and Away,” “Do You Know the Way to San Jose” and Jobim’s “Wave.” It was happily reissued on CD by Rev-Ola.) 1969’s Crystal Illusions featured the group pushing the envelope on a lengthy, eight-minute title track, and saw pop/rock numbers like “Sittin’ on the Dock of the Bay” alongside works by young Brazilian talents such as Milton Nascimiento. Hit the jump for a brief overview of Mendes’ career from the 1970s to the present, as well as a track listing with complete discographical information for Celebration! Celebration ignores the post-A&M output, likely because Universal didn’t wish to license tracks from the albums Mendes recorded at labels including Bell (now controlled by Sony) and Elektra, part of Warner Music Group. During this period, the restless musician explored soul, funk, disco and quiet storm genres, and even scored a film documentary about soccer legend Pele. Although Mendes’ popularity didn’t wane in South America, he didn’t register on the charts in America again until 1983 when he re-signed with A&M. Celebration picks up with “Never Gonna Let You Go,” a Barry Mann/Cynthia Weil song recorded by Mendes and sung by Joe Pizzulo and Leza Miller. Mendes’ belief in the song rejected by Earth, Wind and Fire and previously recorded by Dionne Warwick paid off. “Never Gonna Let You Go,” from his self-titled A&M comeback album, topped the AC chart and hit No. 4 pop, even cracking the R&B Top 30. The 1980s saw further updates to the group, which returned as Brasil ’86 on A&M (with Lani, Gracinha and even Siedah Garrett on vocals!) and Brasil ’88 on RCA. Mendes, solo and with Brasil incarnations, continued to alternate between Brazilian jazz-influenced work and commercial pop for the American market for the duration of the 1980s and 1990s before having another commercial “comeback” with a string of collaborative records on Concord beginning with 2006’s Timeless. In a sense, these hip-hop/R&B-influenced albums aren’t very different than what Mendes did some 40 years earlier, although the sound certainly is. Then and now, Sergio Mendes combined current musical stylings with his Brazilian roots and jazz sensibility. Celebration unfortunately omits “Like a Lover” and “Look Around,” two beautiful compositions co-written by Alan and Marilyn Bergman that originated on 1968’s Look Around. The album was a landmark, with all Brazilian compositions other than the hit singles “Fool on the Hill” and “The Look of Love.” Both tracks were included on the original A&M Greatest Hits for Brasil ’66. Minor quibbles aside, Celebration should prove to be the best two-disc overview of (almost) Mendes’ entire career, roughly following a two-tracks-from-each-album format, and concluding with some previously-unreleased, recently-recorded tracks. Celebration is due in stores on April 5 and can be pre-ordered below.